In the heart of Paris, in the posh building made famous in The Elegance of Hedgehog, Pierre Athens, the greatest food critic in the world, is dying. Revered by some and reviled by many, Monsieur Arthens has been lording it over the world's most esteemed chefs for years, passing judgment on their creations, deciding their fates with a stroke of his pen, destroying and building reputations on a whim. But now, during these his final hours, his mind has turned to simpler things. He is desperately searching for that singular flavor, that sublime something once sampled, never forgotten, the Flavor par excellence. Indeed, this flamboyant and self-absorbed man desires only one thing before he dies: one last taste. Thus begins a charming voyage that traces the career of Monsieur Arthens from childhood to maturity across a celebration of all manner of culinary delights. Alternating with the voice of the supercilious Arthens is a chorus belonging to his acquaintances and familiars-relatives, lovers, a would-be protégé, even a cat. Each will have his or her say about M. Arthens, a man who has inspired only extreme emotions in people. Here, as in The Elegance of Hedgehog, Muriel Barbery's story celebrates life's simple pleasures and sublime moments while condemning the arrogance and vulgarity of power. If you are a food lover, this is a must to read! it is really sad that it is not available in Spanish. This book does stand alone as a well written piece of fiction, however as I bought it after falling in love with Muriel Barbery's "Elegance of the Hedgehog" I think it is worthwhile comparing the works. The narrators in the Hedgehog draw you in as co-conspirators, you love them & are firmly attached to their stories. Gourmet, however does not achieve this result with Mr Arthen, and I don't think it is meant to. Mr Arthen is not a likeable character, however by the end of the novel there is a certain understanding between the reader & the narrator. He lacks "humanity", a critical aspect of Hedgehog. Neither is one sympathetic to his family. This is in part due to some whiny narration. The food descriptions in the book are remarkable. However I don't read food reviews & no matter how good, these did little to engage me. This lacks the language, beauty & philosophy evident in Hedgehog & is therefore disappointing. On it's own it is a good story, well told, if you can cope with the whining narrative of some of the family members. CRINGEWORTHY narrations. Read the printed book. 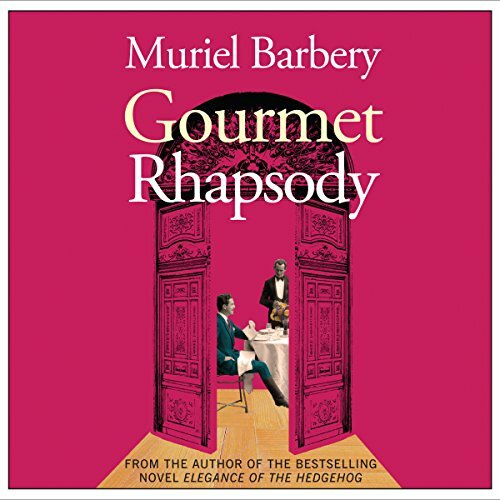 Would you recommend Gourmet Rhapsody to your friends? Why or why not? I would recommend the printed copy. The writing by Muriel Barbery is beautiful and vivid and it is a shame that it is tarnished by awful narrations. The narrations are so contrived and over-acted that they became more of a distraction. They built the figurative wall between me and the characters. I simply couldn't bear listening to the affectations in the voices for more than a chapter at a time. And the post-production of the audio makes certain narrators sound mechanical. And there is nothing worse than over-acted narrations with vocal fries that are being digitally sped-up or slowed-down. If The Elegance of the Hedgehog is an Entreé, this book is more of an Hors 'dOevres. It lacks the depth of humanity and philosophy that is so present in The Elegance of The Hedgehog. Would you ever listen to anything by Muriel Barbery again? Yes, I like her work. If you could play editor, what scene or scenes would you have cut from Gourmet Rhapsody? none, I just didn't like the story premise. I love this author. This is a book that stays with you after finishing it. Thought provoking and deep.